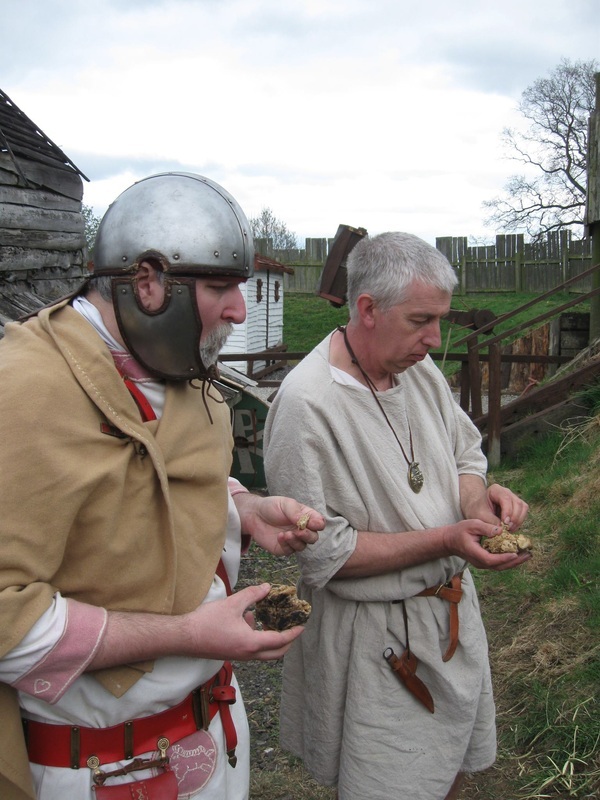 On Sunday 28th April, 2013, we returned to our Roman bread oven at Murton Park to find out whether or not it actually worked. I was first on the site, and was slightly dismayed to find that the weather had not been overly kind to our project. In the month which had passed since building the oven, the dreadful British weather had caused it to dry out unevenly. Along the top, the outermost layer of clay had cracked in places, which upon inspection just broke away in our hands. There appeared to have been a small degree of subsidence, as our base stone was tilted at a noticeably greater angle than when we had left it! Unfortunately, this couldn’t have been helped. 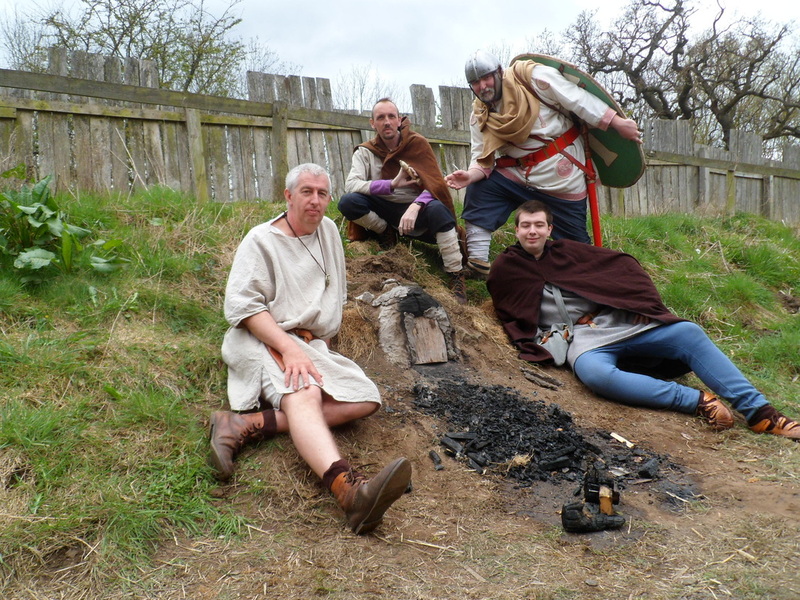 Ideally, if we had been blessed with greater time, we would have spent a day or two after building the oven with increasingly large fires in it to fully warm the clay through and dry it out, but working to time constraints this hadn’t been the case. We had to just accept the weather damage, which was upon a second glance relatively minor. Once the rest of the team arrived, we set to work repairing the oven by replacing the broken areas with fresh clay and sealing the cracks. Then the time had come to light it. To begin with, we built up a moderate fire in the oven, leaving the door and chimney open to allow oxygen to surge through. It was at this point that we encountered a new problem: some small pieces of clay from the inside were spitting out, at times getting quite regular and very violent. Worrying that the entire structure might be on the point of explosion, we tempered the fire down which seemed to alleviate the situation. 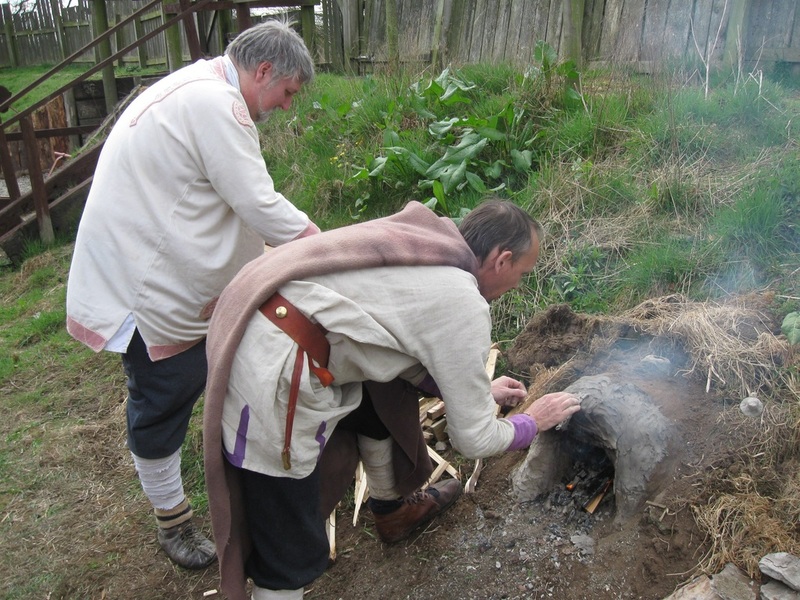 After some thought and a careful examination, we deduced that since the oven had not dried out properly due to the poor weather and having not had regular fires in it since creation, pockets of moisture were causing areas to superheat and burst. By keeping the fire down, we were able to dry the inside out fully, baking the clay, and prevent this from reoccurring. Whilst the fire was burning, we chopped wood and prepared the dough, which we left to warm on top of the oven. After some time, once the fire had started to burn down, we raked its embers out, dousing them with water. 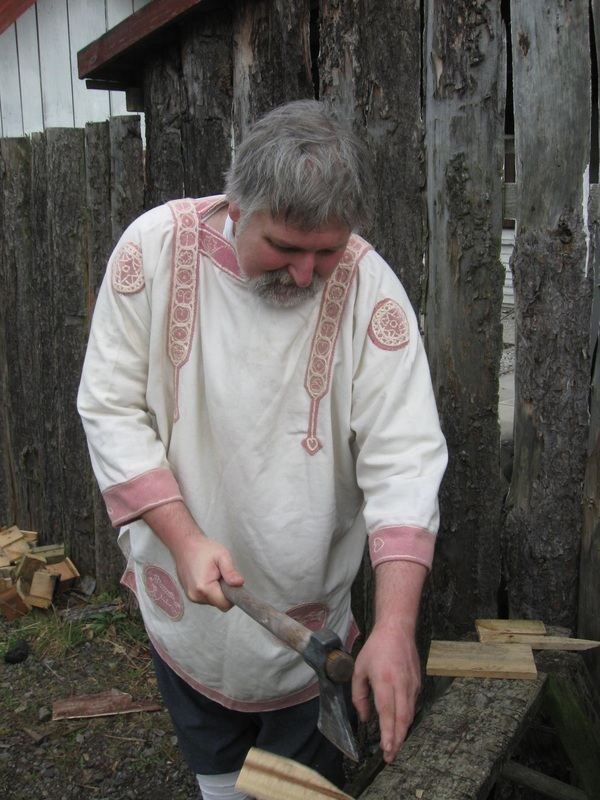 We knew from our experience with the old oven in the Viking village that we now had to act fast. On that previous occasion, we had wasted too much time between removing the continuous heat source and sealing the oven, so that most of the heat had been lost. With our new oven, we moved quickly, resting the bread inside and then placing the door and chimney stopper in position. The door was no longer such a good fit, probably due to the problem of some of the outer layer have cracked and broken off, so we filled in the gaps, along with some hairline cracks on top revealed to us by columns of smoke. We waited for an hour, using the time to talk and play games (see our Roman Games section for some photos and videos we took). When we then felt ready, we broke the seal and removed the door, hoping that the Gods had favoured us and our experiment had worked. Retrieving the bread, we realised that it had barely cooked beyond a slight hardening of the outside. Our first attempt had failed. 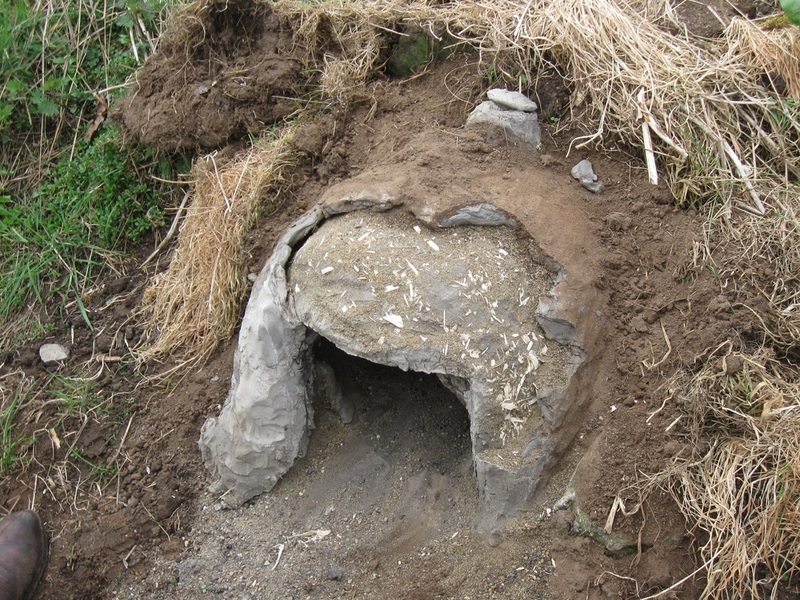 Although disheartened, after two years in the planning and a good amount of time in the making, we weren’t ready to abandon hope for our bread oven, and set to work trying to deduce what had gone wrong. From having watched modern bread ovens on the television, one thing became clear: we simply hadn’t allowed the oven to get hot enough. 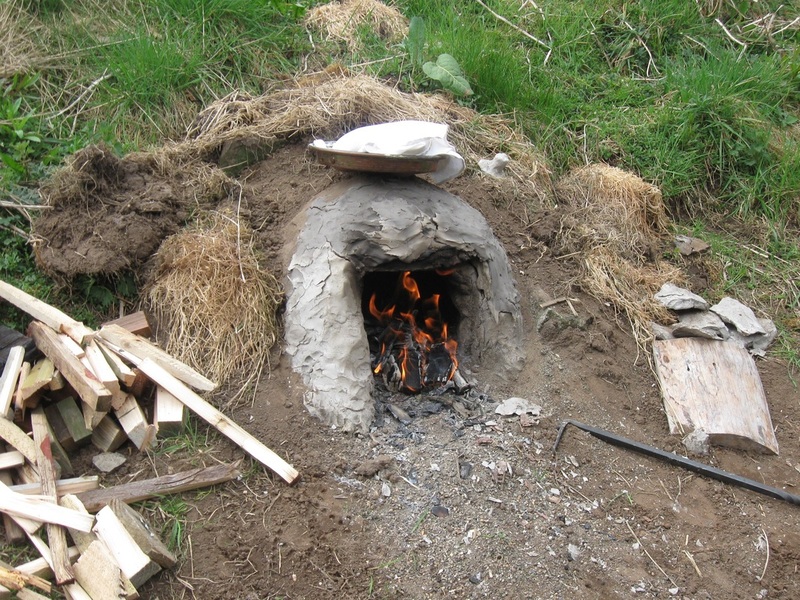 The science of a clay bread oven is simple. 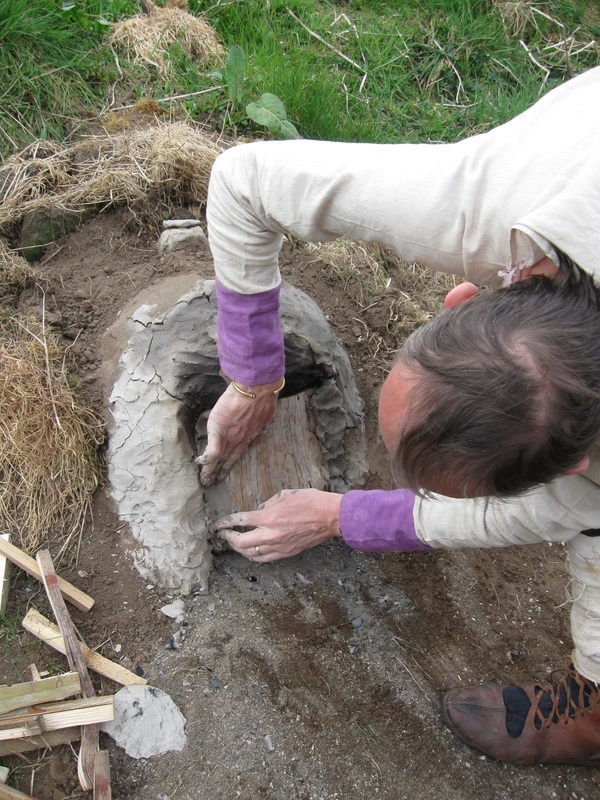 The clay retains and reflects the heat, as does the stone base, so that even though the fire is removed before baking the bread, the residual heat should be sufficient for baking – but that all depends upon both having attained the required temperatures to begin with and having a structure which can retain that heat long enough. We hoped that the problem lay with the former, for if the structure of the oven itself was at fault, there was little we could do with the remaining hours of the afternoon. Our first attempt had failed to bake the bread, but at least it had properly dried the oven out, allowing us to proceed. Filled with determination, we decided to have one last all-or-nothing attempt, putting aside fears of the popping clay situation we had encountered earlier. This time, we built up a truly roaring fire in our little oven, allowing it to burn for nearly an hour, stoking it constantly and feeding it with more wood until our pile ran out. Unlike before, we didn’t allow it to die down too much before preparing to bake. Instead, we raked out still-burning wood to leave a gap sufficient for fitting our bread in, now transformed into smaller rolls in the hope that reducing the mass and increasing the surface area might help. With a few remnants of fire still going at the back of the oven, we put the rolls in and sealed the door as before, hoping that this time we had done enough. Whilst we had calmly gone about our business whilst waiting for the bread earlier in the day, this time the intensity was so great that we just stood around waiting, talking to a few intrepid members of the public who made it up to the fort. Although the whole project had been an experiment from the start, and the main purpose had been to experience building the oven, I for one was on tenterhooks waiting to see what would happen. On the first weekend, fighting against the odds and the elements, we had perhaps come close to experiencing this aspect of the past, empathising with the situation of the soldiers posted in northern Britain tasked with constructing the garrison’s bread ovens, but also enjoying the camaraderie of getting stuck in with the help of friends. That was a valuable experience in itself, but for the oven to be truly authentic, it had to work and fulfil its purpose. Fifty minutes later, after regularly checking that the oven was still hot to the touch (whereas in the first attempt it had been only warm), we broke open the seal and removed the door for the second time. At first, it appeared uncertain whether or not we had succeeded, but when we removed the bread rolls, we realised that they had in fact cooked sufficiently to eat. Breaking them open, we found that the centres were still a bit underdone, but the outsides were baked well. Although things hadn’t gone to plan, we had still achieved something from the day to add to what we had taken from the experience of building the oven back in March. If we learned one thing from this day, it was that our oven did work if used properly. As novices in this role, we’d muddled along through trial and error after conducting our initial research and making our plans, but on the whole it seemed to have worked. The oven itself had been easier to build than we had anticipated given the weather on the day and the tightness of time: a rewarding experience in itself. Once finished, I believe its links to the archaeological finds we had studied were clearly evident, and our construction process had been as authentic as possible. Now we had actually used it, and gained much knowledge for any future attempts. Looking back, it is obvious that we had made a critical mistake in not building up the fire sufficiently in our first attempt, even if we had learned from our past errors in other regards. For our second trial, we rectified this problem, but perhaps did not keep our roaring fire going for long enough, mindful as we were that the afternoon was getting on. 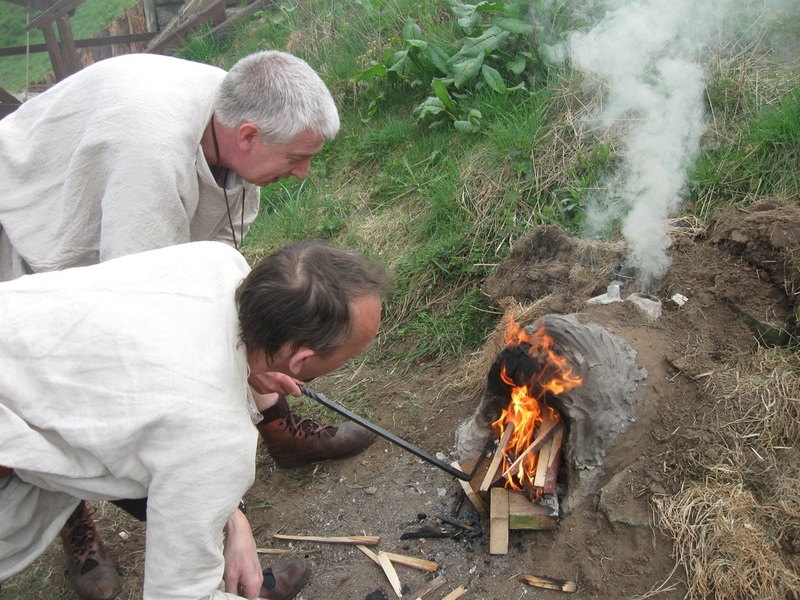 If we get the chance to return and have another attempt, I would suggest we keep feeding the fire for at least two hours – perhaps three – before raking it out and putting the bread in to bake. If we had done this, the rolls would have been fully cooked all the way through, but as with our construction weekend, time was sadly not on our side so we had to somewhat rush. Nonetheless, we were modestly successful over the course of the day, not in the least because we proved the potential effectiveness of our oven and, through the mistakes we made as well as our successes, have been able to draw some important conclusions which will serve us well in future bread-making. Having started with little idea of how to use our oven, we now know exactly how to go about it next time with renewed confidence. Hopefully sometime in the near future we will get the chance. 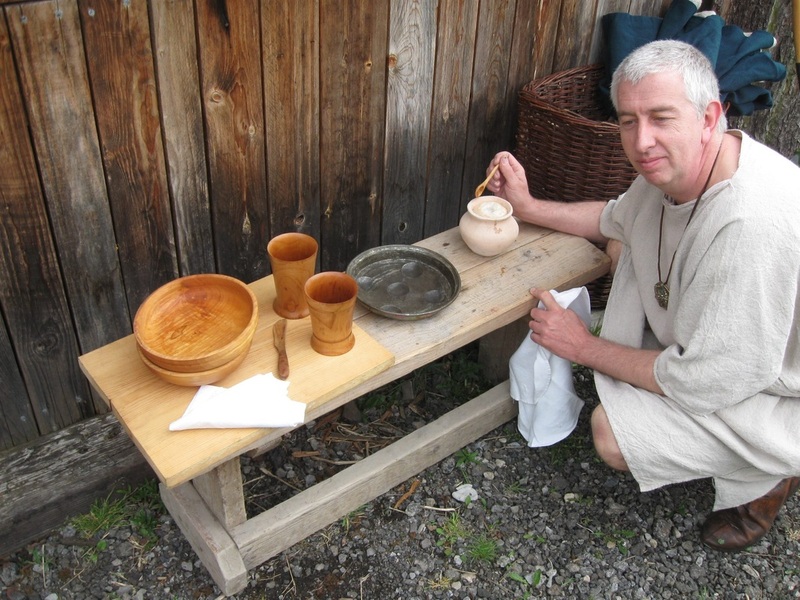 We’ve enjoyed using authentic bread recipes in the past, ranging from Iron Age flatbreads cooked on a flat griddle over our campfire, to honeyed Greek sweet bread and savoury Roman loaves baked in our modern-day ovens at home. 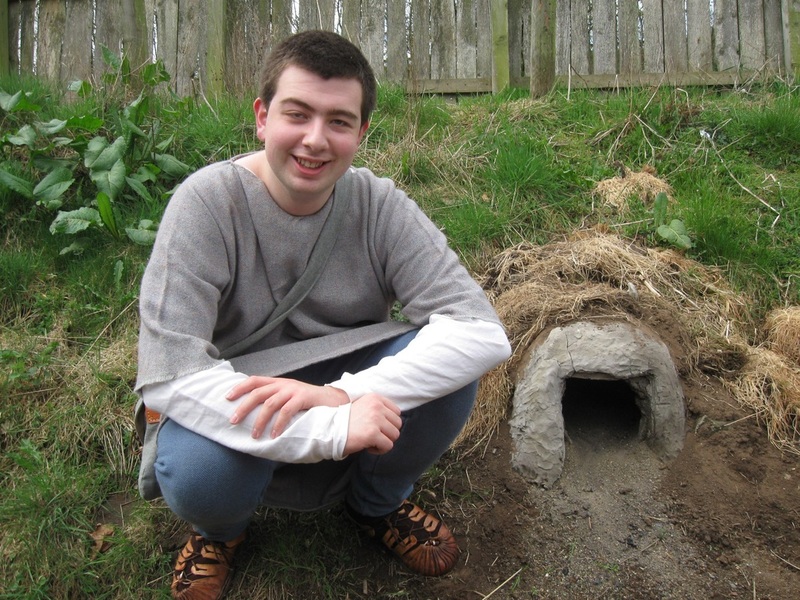 The experience of building and using our clay oven has certainly taken this interest a stage further.